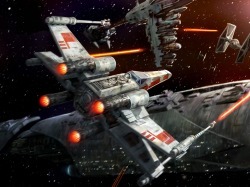 Star Wars The Battle of the Star Destoyer will be 2D drom the side (up, down, left, right). You will be in a x-wing and will be fighting Star Destoyers, Tie Fighters, and Death Stars! Here is the Star Wars The Battle of the Star Destoyer Trial!